FIND YOUR HEALTHY: 5 Weeks, 5 Steps, 5 Ingredients or Less. The N5DIET, designed just for busy gals, such as your badass self, to totally and completely simplify your health. Check out the N5DIET with Leesa’s affiliate link here. This is a guest post on Simple SEO Tips from my friends Jenni & Mimi at Naughty Nutrition. Do you wonder how you can get free targeted traffic from Google by ranking some of your amazing blog posts for certain keywords? This week, my friends Jenni and Mimi from Naughty Nutrition have something super-special for you! They have been rocking their website full of BS-free health information and delicious (“naughty”) recipes, and they’re spilling the beans on how they boosted their web traffic with Google! They created an SEO (Search Engine Optimization) checklist so you can follow their steps and do the same with your health blog. SEO can be a tough game. First of all, if you’re stepping into the online business world because you like to write, or because you’re an expert in your field, learning simple SEO tips can end up being like learning another language (Google’s language to be exact). As holistic nutritionists, our background isn’t in business, marketing, or online growth and promotion. There are no tech classes, or website building classes, and there are absolutely no classes on optimizing your brand to be popular in the online world. You’re not told that starting an online business means learning more about technology than nutrition, really, these are things you have to pick up on your own time. So yeah, learning a language that computers speak – SEO – can be a pretty scary notion. As a matter of fact, when we first started it took us a while to wrap our heads around even the simplest of SEO tricks. We read blog post after blog post, we tried to follow our website’s plugin suggestions to try and beef up the SEO in our content, and no matter what we did we never really ‘got it’. Until we took the time to study it, and we mean really took the time and invested in a deep dive SEO training course. We actually debated if it was worth it and it took us a while to make the investment. All we can say now is, we absolutely wish we learned these simple SEO tips sooner. It would have been so much easier to develop a strategy around SEO rather than going back to the 200+ blog posts we created without the optimization and updating all the elements. In case you’re wondering about the amazing course we took to learn these SEO tools; it’s called Sticky Blogging (NN affiliate link) and was highly recommended to us, and now we will highly recommend it to you. SEO simply means Search Engine Optimization, and in the simplest way put, it’s how you design your online platform (or website) so that Google can recognize you and your expertise. If you want to rank on Google and get real, targeted search traffic, it’s important to try and tell Google who you are and why you’re an expert in your field. Google will only rank those who demonstrate that their sites have value. If your site isn’t properly optimized, you’re only speaking to people you directly send your links to or links you share on social media. So, when there’s no organic search traffic coming your way, this makes it a lot harder to drive the right audience to your blog. But, getting your site fully optimized isn’t an easy task. Many people bring their blogs to bigger companies, or hire someone to teach them how to do it, and that is ok but as a blogger and content writer, you need to know the basics of optimizing your posts and your blog for SEO, and once you create a checklist for your blog and start to apply these simple strategies, it will become much easier day by day. First, we need to let you know that there are two bigger pictures you need to look at when optimizing your website. You need to optimize your entire website as a whole, as well as optimizing each article or content piece that you publish. So we’ve broken it down into two separate checklists with step-by-step tips and pictures to help explain the biggest points. If your Google analytics isn’t set up, this is the first place to absolutely start. This is where you find out how much traffic you’re getting every day, where this traffic is coming from, who your audience is and if there are any trends. You can set up Google Analytics and your Google Search Console (that needs to be connected to your website). Your search console should be connected to your analytics account, this gives you insight into any technical SEO stuff that’s happening in the back end, and it also gives you insight into what people are searching for when they hit your pages. It’s a great tool for figuring out your overall SEO strategy. You can set it up by following these steps or here is a detailed guide as well. Do this right from the beginning, as Google needs some time to collect your data so you can get all the reports and analysis you need. Important: Make sure to use the correct Google email that is connected to your website for setting these up. There is one extremely user-friendly plugin that every website needs and all major websites use, it’s Yoast SEO Plugin. The great thing about this plugin is that it’s absolutely free for most of your basic needs. It guides you on adding how your post title appears on Google, keyword, post description, image title as well as tips on your writing and how you can improve it. And, once you’re done with a post it gives you a green, orange or red light as well as a list of items that you can improve. It’s extremely easy to use and they have a great beginner’s guide to get you started. You can use free tools like Google Keyword Planner to look for keyword ideas. For example, if you are an autoimmune specialist you can search the term ‘autoimmune diet’ in this planner and it will give you a list of keywords that people search for, the competition levels, and how many monthly searches there are. You will need to find the appropriate keywords that match your website, as well as each published post you put out there. Tip: Be sure to find keywords that don’t rank too high, since that would mean that they are high competition and usually paid for. If you are using these keywords and not paying a hefty price you probably won’t show up on google for them. And always try to put yourself in the mind of the user, think about what they are searching for and how they would get to click on your services. Once you know what the main keywords for your website are, you will need to find ways to implement them into your website content. Whether it’s writing 4-5 blog posts about those specific keywords, or adding them to the copy or blog posts you already have. You want Google to know that you know what you’re talking about. Then you would create content using these specific keywords, making sure the titles contain them, and keep them in a spot on your website where they can be displayed. One of the most important things is to monitor how you’re doing month to month. Did you get any organic hits on your website? Which posts did people search for? What were the search terms used? Your Google Analytics account holds all that information and it’s good practice to keep a month-to-month sheet on your progress. The N5DIET, designed by Jenni and Mimi at Naughty Nutrition is for busy gals, such as your badass self, to totally and completely simplify your health. Check out the N5DIET with Leesa’s affiliate link here. Like we said above for applying a site-wide keyword plan, you will need to pick 1 keyword for each blog post you are discussing. Make sure you aren’t duplicating the same keyword on several blog posts (don’t have 2 ‘peanut butter chocolate chip cookies’ posts) because these keywords will compete for each other. You will need to use a great tool for this, especially if you have a lot of posts. We would recommend using something like KWfinder (NN affiliate link), as it gives you access to the best keywords and their competition there. Figure out what your post is about and think about how people are going to be searching for it, for example, ‘Paleo Peanut Butter Chocolate Chip Cookies’ and plug this keyword into your keyword search. Use your search console to see if anyone has clicked on your post already and what search words they have used (which means you already rank for it). When you have your keyword picked and ready, make sure you add it to the focus keyword space in the Yoast SEO section of your blog post. This one is simple, but also not so simple. Once you have your focus keyword, plug it into Google search bar. Now you’ll get a list of how your keyword ranks, and what websites top the list. What you need to do is stand out from this crowd. Make sure your blog post title has the focus keyword in it and stands out by using words that your competitors don’t. Also, make sure your post’s meta description has the focus keyword in it, and your post URL has the keyword in it. For example, if your keyword is ‘paleo peanut butter cookies’ you may be able to make it stand out from the crowd by calling it ’15 Minute Chewy Paleo Peanut Butter Cookies’ just make sure your focus keyword isn’t scrambled in the rest of the title (15 minute paleo chewy peanut butter cookies) it needs to be lined up properly so Google can recognize it. Important: Never change your post URL unless you have a system in place to properly redirect posts. This one is pretty basic, when uploading your photo, make sure the alt-description has the focus keyword in it. 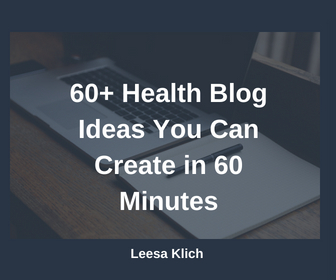 Note from Leesa: I have a whole blog post on optimizing images for your health blog. Google needs to know you know what you’re talking about and in order for it to do that, you need to make sure that your focus keyword is spread throughout your copy. Here’s the key though, Google is also smart (starting to become much smarter than humans, which is kind of scary). Google can see if you’re being sneaky and just placing your focus keyword in the most random spots to try and rank. It needs to read effortlessly. You can also try and place similar keywords on the same topic throughout your text. Your content should be more than 350 words. Using the ‘paleo peanut butter cookie idea’, you may decide to spread other keywords into your text, such as ‘grain free peanut butter cookie’, ‘paleo cookie’, ‘easy peanut butter cookie’ etc. to make sure it doesn’t come off as you’re throwing ‘paleo peanut butter cookie everywhere’. If you’re an expert on a topic, let’s say you were writing an autoimmune protocol blog series with topics on diet, sleep, personal care etc. You would want to add internal links to other blog posts that may be related to your topics throughout your content. This shows that you know all there is to know on the topic. So, as part of every post, aim to have at least 1 internal link to a related post (when linking to that post, use its keyword). But, since Google doesn’t like the know it all posts, it also likes to see that you’re conducting your research well and you’re providing good content, so linking to outside websites and sources will also help with your own SEO. Just make sure not to use your specific keyword as the hyperlinked text and to always source from well-known and trusted websites. Note from Leesa: Need to do your research? I compiled a list of credible resources for your health blog here. There you have it; this is your basic site-wide and post specific SEO checklist. If you want to dive deeper into implementing an SEO strategy with some easy, step-by-step instructions, you can check out Sticky Blogging (NN affiliate link) We highly recommend this course. Have you tried any other strategies to help with your SEO? Comment and share them below. Hey new friend, we’re Jenni + Mimi, founders of Naughty Nutrition (formerly known as The Naughty Nutritionists). Our goal is to give you access to the most accurate, up-to-date, science-based health solutions alongside delicious, simple and healthy food, all without any of the BS attached. Thanks for sharing 🙂 Applying these tips have seen a nice increase in organic traffic to our blog, and we really hope they can help everyone else! Absolutely! This article is full of actionable steps that can make a real difference in traffic from search engines. Thank you for putting it together.